Spent yesterday and today at my mum's. My parents got back from Pakistan utterly exhausted after a nine hour flight to a house full of noise and guests so had to spend the next five or six hours entertaining guests much to our chagrin (at one point my dad's best friend was chatting away to him whilst he had fallen asleep). Was lovely to welcome them home though and we basked in mum's warm hugs and kisses. My aunty was kind enough to cook us a giant pot of biryani despite having to pick her husband up from the airport too. I was so annoyed at the thoughtless guests that I made them tea and served them mouldy old biscuits and stale sweets much to my mum's embarrassment. They came back with gifts for all of us, but best of all they made their house home again. Despite Long-Suffering Sisters best efforts to clear up, mum spent the day clearing mouldering things from the fridge and restoring order to the house. My favourite was her story about the elderly man, his elderly wife and their young grandson that occupied the seat in front of her. A few hours into the flight the old man pitched a fit because he wanted to go home and he could not see why they were not letting him off the flight. His grandson tried to explain and then called an air stewardess to convince the man they were in mid-air. A little while later the old man pitched a fit at his wife because she didn't get him a glass of water. When she explained she asked but the stewardess asked her to wait, he mumbled "what did I bring you along for then?". My mum kept smiling until his last comment when she burst into laughter. 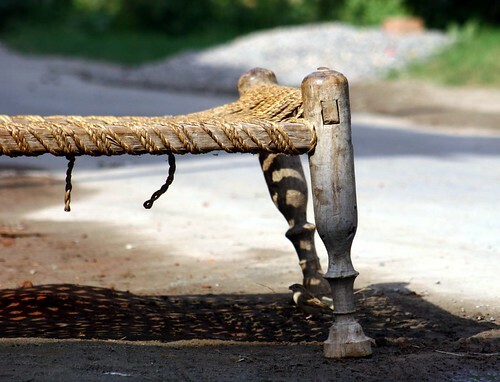 He squirmed in his seat and then declared this manjhi (Punjabi rope bed) is pinching me. Kooky Little Sister got these two suits. A churidar (fit-and-flare dress with fitted trousers) and a trouser suit. The emboidery on the black one is one the back, which seems to be quite a trend at the moment. These two were for Fashionista who loved them and declared hers were the best. This one was for Long-Suffering Sister who is the least adventurous of us style-wise. I thought it was a lovely classic shape. The colours (burgundy and sky-blue) are also perfect if she wants to be a West Ham FC supporter. The only thing was the trousers were a bit short. There is a unfortunate trend in Pakistan at the moment for putting Capri pants with tunics - very appropriate for the majority of traditional Pakistani's - not. Mum says she can undo the bottom and make it longer (otherwise Fash is short and can try cadging it off LSS). Mine was the simplest and most practical (the rest were mostly delicate chiffon and silk numbers). Something warm and smart to wear on a day off. The trousers are plain green and prefectly straight and the tunic comfy and wearable (and in my fave colour GREEN). Little Lady, being nan's little princess, got two suits; a pink sharara (short tunic and trousers that flare at the knee) and a pink (obviously) churidar. So now we have mum and dad back, although they are both still sad and want to talk lots about gran which is fine with me. There is now also a clutch of us girls with lots to wear and nowhere to go (although I am sure Kooky Little Sis will say "speak for yourself" before swanning off to her latest friend's wedding).